Content you’ve purchased for your Kindle Fire HD on Amazon, from apps to music and books, is archived in your Amazon Cloud library. If you finish reading a book, you can remove it from your device. The book is still in the Amazon Cloud, and you can re-download it to your Kindle Fire HD at any time when you’re connected to a Wi-Fi network. 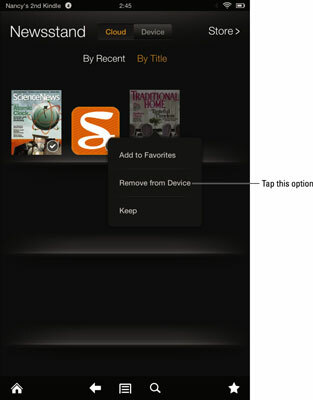 On the Home screen, tap Books or Newsstand to display your library. Locate and press your finger on the item you want to remove. The thumbnail of the item remains in your Books library on the Cloud tab and on the Carousel or Favorites if you’ve placed it there. To download and read the book again, just double-tap it in any of these locations, and the download begins. Unlike video and music, which you can stream from the Cloud without ever downloading them, books, magazines, and newspapers can’t be read from the Cloud; they must be downloaded to a Kindle device before you can read them. If you download a periodical and then press your finger on it in Newsstand, you see the Keep or Remove from Device options shown. At some point, old issues will be removed from your device unless you choose to keep them by using the Keep command. Book samples will offer only a Delete option when you get to Step 3 above. The New Oxford American Dictionary offers only the option of adding it to Favorites because it’s pre-installed by Amazon.